I'm so proud of my sister, Molly, and her husband, Tyson Ritter. First of all, they are both extremely talented and second they are both brilliant. For Christmas last year I gave Molly a giant coffee table book of Gil Elvren pin-up art. She's got a very classic style and is always putting up her hair in victory rolls and wearing retro-style dressed and heels, just for funsies. She loved the book, but got to thinking about poor pinups' responses to the awkward positions they find themselves in. I know if I got my skirt caught in my bike and flashed the whole neighborhood I'd get a little upset. So Molly and Tyson decided to combine her styling and modeling skills with his photography and shoot a calendar documenting some pin-ups who've had it up to here with their domestic duties and are fighting back. 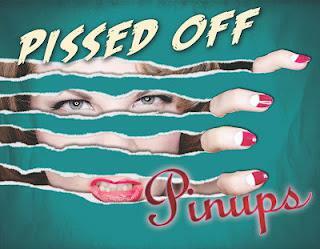 Pissed off Pinups was born and a kickstarter launched earlier this month. There's still 21 days left to get your pledge in and for just $25 you get a calendar! My darling, gorgeous, feisty, little sister. Here's one of the 12 awesome shoots included in the calendar. The calendar will also feature ladies lighting bras on fire, dropping bowling balls on scales and ripping apart feather dusters. 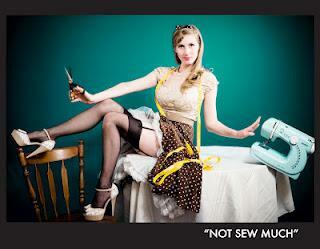 What modern woman hasn't wanted to do those things? So head on over and pledge at least $25, 2013 will be better for it.